Even in the history of a group who announced titles for albums that never materialised with ideas that never got off the ground, Coil's Backwards has had a turbulent history. Recorded on and off in the years following Coil's seminal Love's Secret Domain it was originally destined for the American market via Trent Reznor's Nothing Records. It never materialized though. Danny Hyde puts forward the reason that, "It was to be released ... it should have been released ... but because of issues with grey men it wasn't" but that only tells part of the story behind Backwards. Recording sessions for Backwards flitted between the UK and Reznor's New Orleans studio but Coil were never happy with the results, believing they were too rhythm and lyric based with structures that relied too heavily on a start, a build and a finish. And more often than not when they returned to the tapes they found that they were no longer interested in the sounds. In interviews, it is clear Peter and John struggled with Backwards and what, if anything, would constitute a definitive version. They even considered a subsequent version which would mutate and explore the sounds reflecting their more varied pursuits, which resulted in such stunning offerings such as the Coil related projects ELpH and Time Machines and the heavenly Musick To Play In The Dark volumes. Tapes of these Backwards sessions, which involved the late John Balance and Peter Christopherson with Drew McDowall and the assistance of Danny Hyde, have been circulating for years, but Danny Hyde has preserved a selection of these tracks which now comprise this version of Backwards. Arguments will persist on whether this should have been released at all - something that also applies to the recent Threshold Archives rebooted reissues by Jon Whitney of Brainwashed, released with the blessing and involvement of Peter Christopherson prior to his death - but Backwards is illuminating in that it provides a conduit to Coil's interests and workings at the time. Many of these tracks would subsequently resurface under the guidance of Peter Christopherson following the death of John Balance on the posthumous releases The New Backwards, remixed with the aid of Danny Hyde, and reworked on the The Ape of Naples, with both Ossian Brown and Thighpaulsandra and members of the expanded Coil live set-up. From the short intro of burbling synths warming up 'Backwards' follows with juddering beats, industrial crush rhythms and melodic synths as Balance screams the title. It's a forceful delivery as he rasps his way around personal apocalyptic and sexual wordplay. There's a raw, aggression to 'Backwards'; it's almost as if 'Backwards' acts as vehicle to revisit the raw, animistic power and madness of their earlier releases as they paraphrase lyrics found within earlier releases such as the "sickly sweet sound of death warming up", recalling 'Ostia (The Death Of Pasolini)' and "everything dies" from 'Blood From The Air'. There's also a sense of Burroughs in the air as Balance screams, "Get cursed, get hexed". 'Backwards' featured regularly in Coil's live manifestations and on The New Backwards, and this unrelenting version represents a powerful energetic start to Backwards. It doesn't all stay that way. On Backwards 'Amber Rain' comes across like a ballad, with Balance's effected voice bathed in atmospheric tropical birdsong over tumbling piano notes. It's understated when compared to the version on The Ape of Naples, but you can't mistake the tragedy when Balance with startling premonitory precision concludes "I don't expect I'll ever understand, How life just trickled through my hand". With backward spinning tape manipulations, cut-up electronics and spliced voices 'Fire Of The Green Dragon' crudely revisits the acid derangement of Love's Secret Domain. Although harsher the rhythmic pulse is reminiscent of the derivative dance beats of 'The Snow'. Backwards was of course partly recorded at Trent Reznor's studio and was slated for release on his Nothing Records label and with its shuddering electronic shifts and ceaseless hyper manic industrial rhythm, 'Be Careful What You Wish For' really reminds of Nine Inch Nails and naturally the remixes Coil worked on for Nine Inch Nails. Yet Coil were always so far ahead of the pack musically, so to find both 'Fire Of The Green Dragon' and 'Be Careful What You Wish For' so steeped in the influences of the time is regretful. It's not at all what you'd expect from Coil, and it partly explains why, I suspect, Coil were reticent to release Backwards in this form. Much more effective is 'Nature Is A Language' which catches Coil at their most primitive with the warped textural treatments of electronics, undulating synths anchored around a persistent rhythmic thrust, riddled with effects and treated layers of voices, as Balance unknowingly quotes Morrissey's lyrical couplet from The Smiths 'Ask' in the lines "nature is a language - can't you read?". There is something engaging, created by the old analogue equipment and the voice of Balance subject to sidereal treatments. "It's the rush hour of the Gods" he proclaims, while continually asking "can the animals see this"? In our review of Coil's The Ape of Naples I commented that the pounding electronics of 'Heaven's Blade' was clearly a concession to generic dark industrial music, being a product of Coil's ill-fated Backwards sessions. Here that industrial dance aspect is pushed to the limits with John Balance's devastating lyrics of self-mutilation - "I cut myself with heaven's blade" - delivered over a setting of rolling dance beats, worming synth squeak with an end section cut with strings, offering a symphonic workout to the incongruous dance beats and piano chime. With a less forceful vocal delivery it's a potent and interesting take but I still much prefer the more commanding version found on The Ape of Naples. 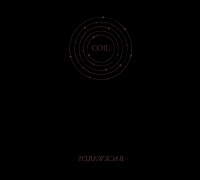 'CopaCaballa' and 'Paint Me As A Dead Soul' offer an embryonic take on the approach Coil would finesse for the sacred tones of the Musick To Play In The Dark volumes. Starting from treated vocal in an authoritative timbre Balance weaves the writings of Austin Osman Spare and Shakespeare's Macbeth with the self-proclamations of Papa Doc on 'CopaCaballa' over shape changing tones and rhythmic beats. It's a great track and better than the chugging electronic take found on The New Backwards. So too is 'Paint Me As A Dead Soul', paraphrasing Crowley's soon to be scarlet woman Leah Hirsig's request to the Great Beast about the painting of her portrait, over tinkling and crepuscular keyboards. Delivered in a creepy manner similar to the later workings of something like 'Paranoid Inlay' with a lyric referencing Crowley artwork these versions really do Backwards justice and need to be heard. Featuring on both The New Backwards and The Ape of Naples, 'AYOR (It's In My Blood)' in this guise, comes over as a sketchy thanatos fixated rave-up over skittering electronics and washes of scratchy textures as Balance confesses "It's in my blood", an oblique allusion to his ongoing battle with alcoholism which ultimately contributed to the fall that lead to his death. A more full bodied version in a similar vein appears on The New Backwards but this edited version is shorn of the orchestration of its radically different appearance as 'It's In My Blood' on The Ape of Naples. With warming church synths shrouding Balance's distressing words on prison life, 'A Cold Cell', comes across as a rare political hymn from Coil sung from the perspective of someone interned within a prison, complete with whispers and prison cell effects. 'A Cold Cell' would later be substantially reworked for The Ape of Naples, but I'm pretty sure that this version first surfaced way back in 2000 on one of The Wire's Wire Tapper compilations and it is by far a more effective version and amidst all the rhythms and chaotic ruptures found on Backwards, 'A Cold Cell' is serenely emotive. Just as it opened The Ape of Naples, 'Fire Of The Mind' closes Backwards. With Balance intoning the immortal line: "Does death come alone or with eager reinforcements", 'Fire Of The Mind' has become a central track in the canon of Coil. Propelled by a death rattle and edgy electronics augmenting the sombre keyboard melody, it is less compelling, when compared to the sacred version that opened The Ape of Naples. However, the mantra like delivery of 'Holy, holy' remains powerful and the inclusion of an additional verse, paraphrasing a title from the cat artwork of Louis Wain it provides insight into how the track evolved into its final appearance on The Ape of Naples.